I saw a version of this recipe in Food & Wine and had to try something that combines two of my daughter's favorite foods: crab and bread pudding. And come to think of it, those are two of mine, as well. But the F&W recipe was called "Buttery Crab Bread Pudding," and contained not only more than a stick of butter but also a cup of half and half. Here is a somewhat lighter version, still a rich meal -- and a great hit at dinner this past weekend! Spread each slice of bread with a little margarine and stand up the slices in the prepared baking dish. Spoon the crab mixture evenly between the bread slices. In a bowl, whisk the eggs with the milk, half-and-half, and a little salt and pepper. Pour the custard evenly over the bread and let stand for 10-15 minutes. Bake the bread pudding for 30 minutes, until the top is lightly browned and the custard is set. 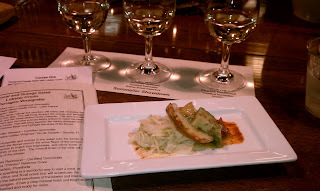 Note: This dish goes perfectly with a French chardonnay, or one from California that isn't too oaky. Here's a recap of my healthy foodie rules for living the good life -- a life that is healthy, of course, but also happy and fulfilled. Few of us will be able to live up to these goals all the time, but I do think it's worth trying, most of the time. Scroll down to older posts if you want to read details or tips for how to build these principles into your daily life. The wine store/catering business in O'Bryonville called Art of Entertaining hosts cooking classes, wine tastings, grill-outs (in good weather) and all sorts of other parties, but for my money the best thing they do is an occasional "Sommelier Showdown" in which three local wine experts compete to see who can devise the most harmonious wine pairings with an array of dishes produced by the Art of Entertaining chef and assistants. Charles Redmond won the night! This week was the first such competition this year -- they did a couple last year -- and the owners promised to make it quarterly in 2012. I had attended the final one of 2011 sometime in the fall and had such a grand time, I knew to sign up right away for this one. 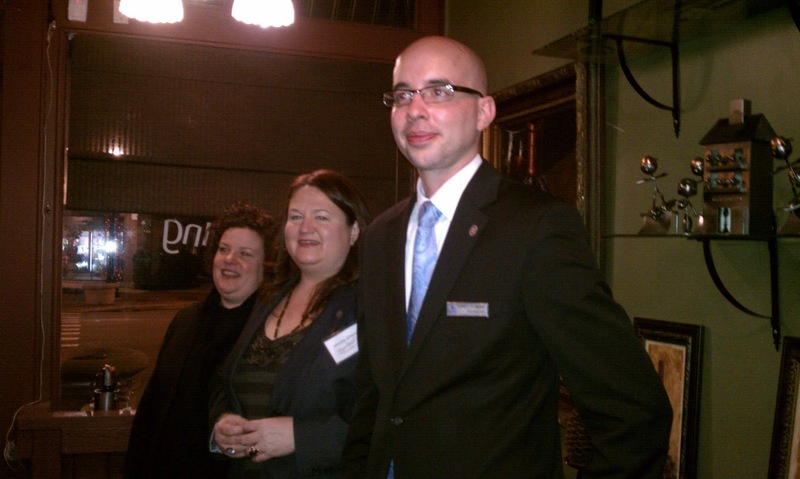 Mary Horn (two-time defending Sommelier Showdown champ), Jennifer Stewart and Charles Redmond were the wine experts who delighted a house full of participants on January 24th. THIRD COURSE: Seared duck breast with cherry demi, Brussel sprouts, bacon hash and star anise (Mary's 2009 Catena malbec won this round, but I preferred, and bought a bottle of, Jennifer's Austrian red wine called St. Laurent, a cousin to pinot noir). FOURTH COURSE: Braised short rib with celery root horseradish puree (Charles took the honors again with his 2009 Domaine de Fontsainte Corbierres). The champ for the night was Charles Redmond -- who currently delights diners at Orchid's restaurant downtown -- with Jennifer Stewart coming in second and Mary Horn losing her crown, at least for now. Be sure to contact Art of Entertaining to get on their mailing list if you'd like to know when they do this again. My friends and I thought it was a grand time! 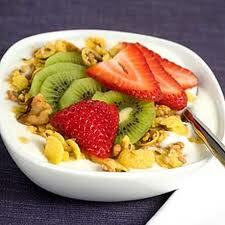 That is: always start your day with a healthy breakfast. Even a less-than-healthy breakfast (bacon and the like) is better for weight control than none at all. Here's yet another potential benefit of eating breakfast: a richer, happier life. Yes, really! In the study, people who often skipped their a.m. meal reported bigger drops in vitality, social functioning, and mental and emotional well-being compared with the breakfast eaters. So belly up to the breakfast table each morning. You'll look better and feel better if you do. 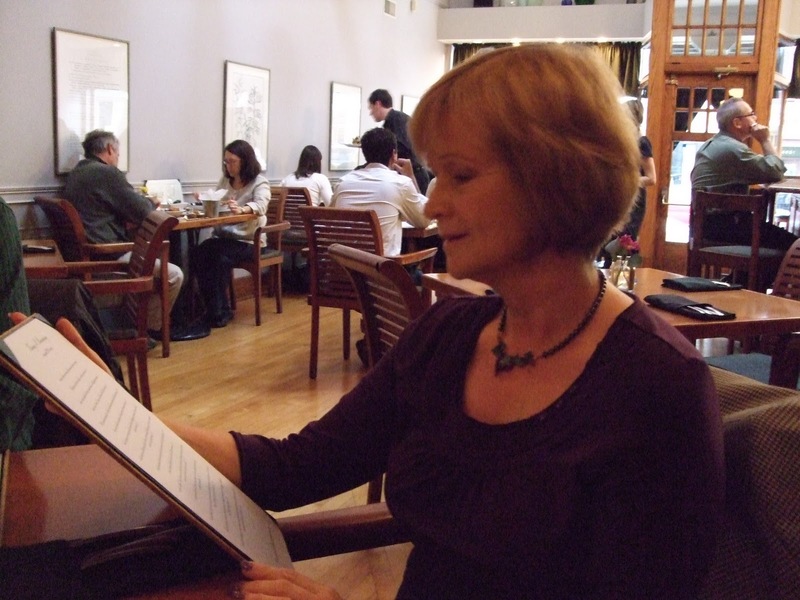 Healthy Foodie New Year's Tip #9: Have and follow a strategy when you eat out. Here are a few ideas for making dining out a fun, rewarding experience that won't spoil your resolutions for a leaner, healthier new year. Dip in olive oil. If you can't get veggies and the restaurant brings you bread, dip it in olive oil. People who opt for this over butter eat less bread. And if the bread-basket includes choices, go for the browner, whole-grain stuff. Request the bottles. Order oil and vinegar on the side. 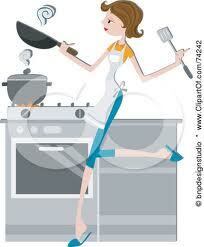 Relying on the kitchen to dress your salad -- even with oil and vinegar -- can deliver as many as 450 extra calories. If you want a more elaborate dressing, ask for it on the side and use the tiniest bit possible. Savor your wine. Ending a meal with a glass of wine lets you avoid the cloying aftertaste of sweets . . . and helps you avoid calorie-bombs, too. Sometimes a foamy (decaf) cappucino can be satisfying, too. One snack strategy is to make up several days' worth of raw veggie and fruit snacks, put them in single serving zip-lock plastic bags and so that I can grab one when needed. 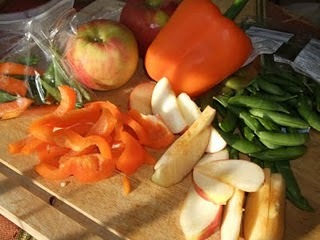 My baggies usually include slices of orange bell pepper, crispy-sweet sugar snap peas, and apple slices. In summer, I'll find a substitute fruit for the apples. I'm a huge fan of Trader Joe's peanut butter pretzels, the variety with "no salt on the pretzel." You still get salt in the PB itself, so you won't feel deprived of a salty snack. At the same time, you won't be overdoing the sodium. Other recommended snacks -- choose the ones you like best -- include a container of low-fat or fat-free, no sugar added yogurt; a handful of no-salt-added nuts; a small bowl of cereal with skim milk; crackers with a smear of crunchy, natural peanut butter. Even if you follow all the best health habits to the letter, you can't control every variable. Genetics (family health history) plays a huge part in our fate, and those factors are totally out of our control. 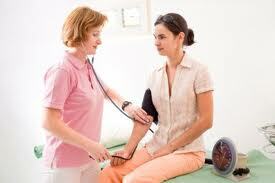 Therefore, be sure to get regular checkups and all recommended screening tests for your age and gender. Pay attention to your body and don't ignore feelings that you know in your gut aren't right. In the spring of 2010 I noticed rather suddenly that my usual exercise routing caused a great deal of fatigue. If I walked up one of the hills in my neighborhood as I'd done countless times before, it seemed as though I were trying to scale Everest. So I'd drive to a flatter part of my 'hood and try to get my exercise there; even that had me out of breath within a short distance. Long story short: two of three major arteries were 90% or more blocked and I ended up with four stents in those arteries. It was shocking, but not surprising given my family history (dad dead at 58 of heart disease, brother with triple-bypass in his early 50s). So even those of us good health habits can have life-threatening health challenges well before old age. Never take your good health for granted! Healthy 2012, Tip #6: Fat can be good for you! Unless a physician tells you otherwise, there's no reason to avoid all types of fat in your meals and snacks. The ones from plant sources known as monounsaturated fatty acids (abbreviated as MUFA) should be part of the healthy foodie's diet. The fat in many types of fish is also essential for your health and well-being. Conversely, we should minimize or avoid "bad" fats, which include those from animal sources--found mostly in meat, poultry and dairy products--as well as the largely man-made stuff known as trans fats that extends shelf life in a range of processed foods. This posting is about what we should be eating, and less about what to avoid, so I'll make the avoidance part brief. For packaged foods, read labels. If the ingredient list includes the words "partially hydrogenated," put the thing back on the shelf and step away! Avoid fatty cuts of meat--or avoid meat/red meat altogether; remove all skin and visible fat before you eat meat, fish or poultry; choose fat-free or low-fat dairy products. OK, enough of what not to do. Here are some of the fats we CAN and SHOULD eat. Of course, fat of all kind has more calories by weight than do the other food groups (proteins and carbohydrates), so if weight control is an issue, be careful not to overdo. 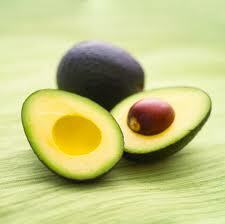 AVOCADO not only tastes marvelous, it also is a very healthful food. NUTS of all kinds are loaded with MUFA and satisfy hunger longer than many other snacks; add nuts to cereal and/or salads for a MUFA boost. 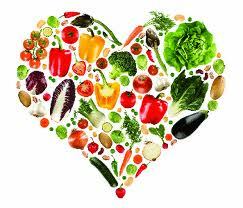 OLIVE OIL as well as CANOLA OIL are great for you. The lauded Mediterranean diet is based on cooking with olive oil -- and eating it on bread (instead of butter or margarine) and salads, among other uses. Olive oil is our go-to oil for dipping and for salad dressings, while I usually cook with canola oil thanks to its higher smoke point. (It works better for stir-frying or sauteeing, I find). 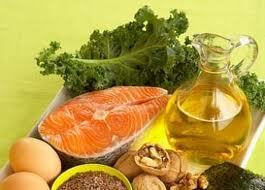 Fats are satisfying to the palate and help to make you feel less deprived, if you're trying to lose weight. So don't go fat-free as you combat any fat on your body that you'd like to shrink. Water, tea, wine, coffee and cocktails. Plain water, whether bottled or tap, should be every healthy foodie's main beverage. If you drink alcohol -- as I often do, having wine with dinner most nights -- be sure to drink one glass of water for each glass of wine or other alcoholic beverage. Tea has been my morning caffeine drink of choice -- I make a large pot with loose-leaf black tea most days, and of late I've enjoyed home brewed coffee as well. Many studies conclude that both tea and coffee can be part of a healthful diet, with green tea having the most beneficial antioxidants. The research on coffee has been very positive in recent months and years; for me, the only reason to limit it is that I'm very sensitive to caffeine after about 10 AM. As you probably know, wine and especially red wine has been shown to have health benefits, although consuming more than a drink or two a day of any alcohol should be avoided. The drinks I actively avoid are those that add nothing but empty calories to my daily tally--or the vitamins in them are overwhelmed by the sugar and/or fat they contain. 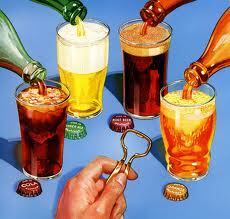 This means no soda -- I try to minimize diet sodas to an occasional indulgence -- and no fruit juices. 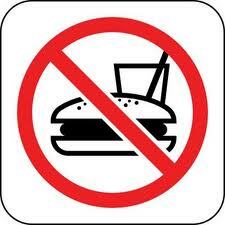 Not to mention no milkshakes or obscenely caloric coffee drinks. It's not that hard to stick to water when you're thirsty and simple coffee or tea when you need a caffeine boost. Save those calories for something you can sink your teeth into! I recently received a copy of Joy Bauer’s Food Cures (Eat right to get healthier, look younger and add years to your life) from its publisher, Rodale Press. It's very interesting, well researched and engagingly written, enough that I can heartily recommend this book for the healthy foodie. On the back cover and first pages are testimonials from food-oriented celebs such as TV chef Bobby Flay, Meredith Viera and South Beach Diet author Arthur Agatson, among others – as well as an impressive list of medical professionals. Joy Bauer has is a nutritionist who writes regularly for Women’s Day magazine and appears as a nutrition expert on the Today Show. I like the author's organization the material, with the book divided into sections such as Losing Weight, Looking Great, and Feeling Good, and further subdivided into chapters that address virtually any type of health concern a reader might have. So if, for instance, you suffer from insomnia, PMS or arthritis – among many others – you can flip right to the chapter that will help you figure out the best foods for your particular areas of interest. Other chapters cover vision, memory, headaches, depression, cancer, heart disease and Type 2 diabetes, along with chapters on keeping your skin, hair and teeth healthy. 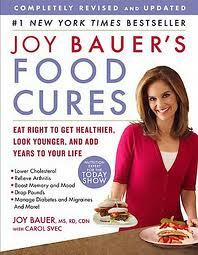 I consider myself a fairly well-read health consumer, and yet I learned quite a lot from Joy’s book. Each chapter begins with the “basics” of the topic, and the author has condensed up-to-date research results in very approachable, readable prose. (Information sources are saved until the end of the book so as not to clutter the chapters.) Next she writes about the relationship between food and that chapter’s focus; then a step-by-step plan for incorporating the right foods into your lifestyle. Each chapter concludes with a few recipes (3-5 per chapter), giving the reader a total of perhaps 70 healthy recipes throughout the book. I haven't tried any of the recipes yet, but they seem well written, clear and easy to follow. Go here to learn more about Joy Bauer, this book, and her other work. 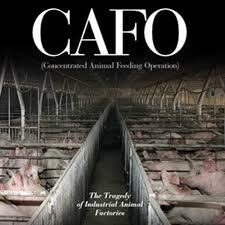 Unless you're vegetarian, it's almost impossible to opt out completely from the industrial meat system. For instance, when eating out you're highly likely to be served meat, poultry or fish that was inhumanely raised, fed ingredients that the animals don't naturally consume, handled in ways that promote dangerous food-borne illnesses and/or farmed (in the case of much seafood). It's daunting, when you think about it. My response has been twofold. One, I absolutely never eat fast-food meat of any kind, including stuff I used to order occasionally such as an Arby's roast beef sandwich or a grilled chicken sandwich at one of the fast-food joints that seem to be your only choice sometimes. Frankly, this has not been hard since I have never been a fan of fast food. Second, I try not to buy meat or poultry at supermarkets, and I'm also very careful about where I buy fish. When possible, I buy meat and poultry from local farmers who raise their animals naturally and handle their products with extreme care, or when that's not an option I'll look for organic meat from stores such as Whole Foods or Trader Joe's. It's very hard to be 100% pure even in these halfway measures, but it's a step in the right direction. Healthy Foodie Rule #3: EXERCISE 45-60 MINUTES A DAY. Yes, that's a high standard, and it's not always possible. But if you count every type of physical exertion, from walking to stretching to crunches on your bedroom floor, over the course of a day you can usually reach this minimum level of exercise. 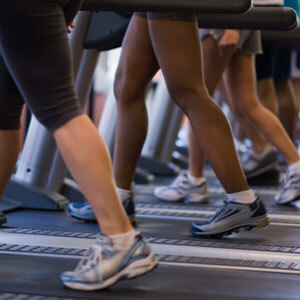 Most exercise specialists agree that if you can't do 30-45 minutes of cardio in one time period, it's okay to spread shorter bursts throughout the day. Take a 20-30 minute walk in the morning and another on your lunch break or after work -- whatever works best in your schedule. We bought a treadmill about a year ago and put it in our basement, where we also installed a television with cable hookup, so watching the Today Show before breakfast helps me to get through 30 minutes of cardio. It's been great in the cold, dark months when outdoor exercise is impractical. But cardio exercise isn't the whole story. 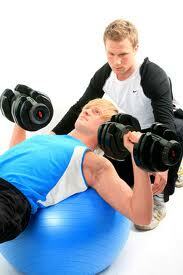 You also need to incorporate strength training and stretching. Pilates counts as strength training, and yoga gets the stretching in, making both of those practices quite beneficial. 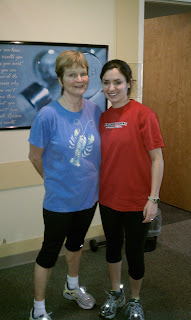 A big change in my fitness routine has been that in October, I signed on to work with a trainer. She's helping me with strength, endurance, mobility and improving my posture. If you can't fit that into your life, then figure out some other way to do weight-bearing exercise at least a couple times a week. I find that my health and happiness -- including managing stress -- depends on keeping up this exercise regimen. Exercise is vital. And remember, the more you exercise -- the more you can eat! Healthy Foodie Tip #2 (Eat Nine Servings of Fruits and Veggies a Day) may sound off the wall, but if you can do this, your waistline is bound to shrink. If that seems impossible, keep in mind that nutritionists' agreed-upon serving sizes are pretty small. For instance, I always have fruit with breakfast, no matter what time of year it is. Right now I'm eating half a red grapefruit most mornings along with oatmeal or cold cereal heaped with berries. Another fruit-filled breakfast is berries and bananas (in summer, you can expand to include cut up peaches and other treats) topped with vanilla yogurt, a handful of nuts and a couple spoonfuls of granola, for crunch. I find it easy to get two or even three fruit servings at breakfast. 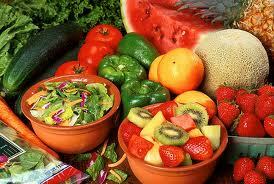 Salad (with fruit on it as well as raw veggies) or vegetable soup make up lunch whenever possible. And half our dinner plates are filled with cooked vegetables every night...unless we're eating out, which is a horse of a different color, naturally. (It's very hard to eat enough vegetables when dining out, alas.) I figure at least four servings total from lunch and dinner, more if lunch is a large salad. That still might not be quite enough fruits and veggies, so I always have cut-up veggies for a mid-morning snack and/or with my lunch, about two servings' worth, and fruit snacks at least once a day. Apples from the fall crop are still quite good, and we live on the wonderful clementines now at their peak. As we launch 2012, here are ten "Healthy Foodie Rules" for living the good life. Austerity and sacrifice, let alone starving oneself in the name of slimming down, are off the table -- it's counterproductive and dooms us to long-term failure. Instead, I try to follow these principles. Here's the list, with elaboration on #1 below. Over the next week or so, I'll elaborate on the others. I'm all for using kitchen shortcuts, such as buying pre-peeled and cut veggies, but in general your meals will be healthiest when made yourself, from scratch. 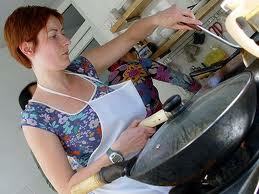 I heard food author Michael Pollan say it's OK to eat as much "junk food" as you want--as long as you cook it yourself. He was talking about French fries, which used to be a very occasional treat for most people, if only because deep-frying potatoes makes a huge mess in the kitchen and most people don't want to hassle with that very often. Now you can drive through a fast-food joint and get a piping hot, salty hit of crispy potatoes any time of day or night, any day of the week. Insanely, French fries are by far the most widely consumed "vegetable" in the U.S. But if you only ate them when you made them yourself, how often would French fries be on the menu? If you do want to make your own "fries," try doing them in the oven. Better yet, make them with sweet potatoes rather than white ones. Take-away point: eat most of your meals at home, and bring a lunch from home with you to work. You'll be healthier and slimmer as a result.